Say Goodbye to Saggy Knees! Join Us for Our Event on Thursday, April 18, from 5-7 pm, at Our Eastside Location! If you hate your knees, this event is for you! We'll look at how to get shorts ready by smoothing out your wrinkling, sagging knees.! We all want great looking legs in summer shorts, dresses, and bathing suits, but sometimes as our skin ages, it doesn't cooperate. As we age, our knees begin to sag. Reduction in collagen, reduced muscle mass, and gravity are just a few of the reasons this happens. Sculptra can make a difference. Join us for an exclusive look at the treatment of wrinkly, sagging knees with Sculptra®® Aesthetic. Sculptra works with no downtime and immediate results, so this is one event you don't want to miss! You'll enjoy a live demo to see just how well this treatment works as well as refreshments. Get the Glow: Purchase HALO for your face, get your hands free! Halo restores your skin's youthful glow by minimizing sun spots, fine lines, wrinkles, enlarged pores, uneven skin tone, poor texture, and scars. With minimal downtime, HALO works on damage you can and can’t see! Value $500. Good through April 30, 2019. More BOTOX savings! Get your $50 off coupon today! It's for new and existing Brilliant Distinctions members. One per customer. Supplies are limited. Some restrictions may apply. Hurry - we're collecting clothing through April 15! You earn 500 Perks Points (worth $25) for your donation (only redeemable once)! Bring laundered/ironed professional attire that's not more than five years old and suitable for a job interview to donate to Dress for Success. Your professional apparel gives another woman the confidence to enter or return to the workplace, make a great first impression and land a job that could change her life! Accepted clothing includes interview-appropriate suits, professional separates like blouses, slacks, skirts, dresses, blazers and jackets, work-appropriate shoes and handbags. Simply drop your items off at one of our locations at 1861 North Webb Road or 3931 N. Ridge Road. Thank you! 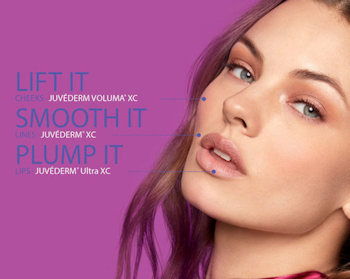 Juvéderm It and Save $75! When you select any Natrelle® gummy implant for breast augmentation, you receive your choice of a FREE treatment of BOTOX® OR COOLSCULPTING! Plus, see how you can share the love with a friend! *Some restrictions may apply.